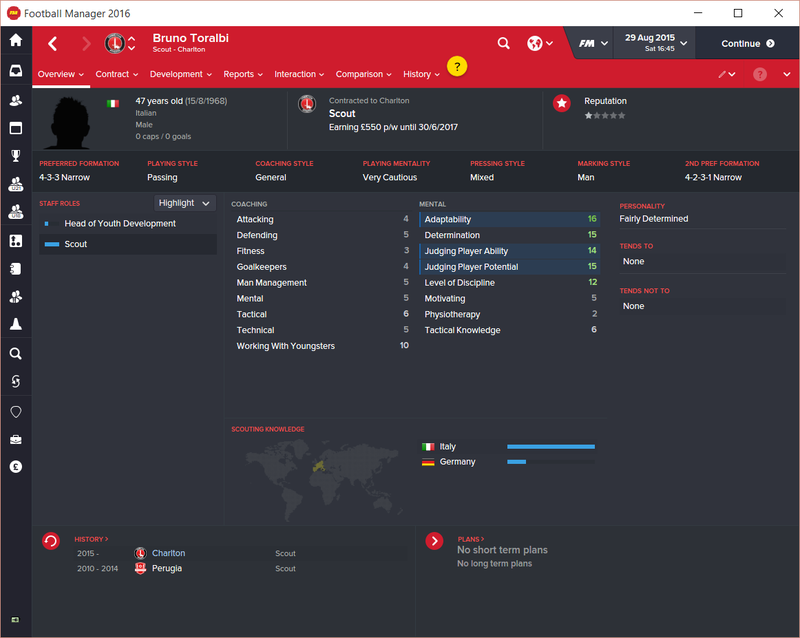 I think that Football Manager 2016 is the first time that I have been able to take over my club with an almost entirely clean slate. 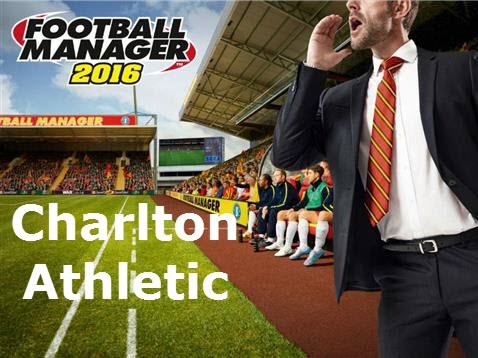 In real life that is not a good thing, but I am not here to talk about real life, instead I want to focus on the Alternative Reality that is Football Manager 2016 and the seasons ahead. For those of you like me who have played this game for many years you will know that long term success at a club is reliant on much more than just getting the right players in and letting them run riot. You need tactics, you need to have a way of dealing with press conferences, player chats and team talks, but you also need the right staff. Sometimes it feels like this side of the game can be overlooked, there are tools out there that help you find this or that, and they can alleviate the need for this side of the game, if you want to do that then go for it but I would feel like I was missing out on something if I didn't take in the experience as a whole. So today I am going to focus on my staff. As I said before I basically have a clean slate to work with at Charlton, the ownership have cleaned house, no assistant manager, our long serving chief scout has gone off to Fulham and we have a skeleton crew in terms of coaching. 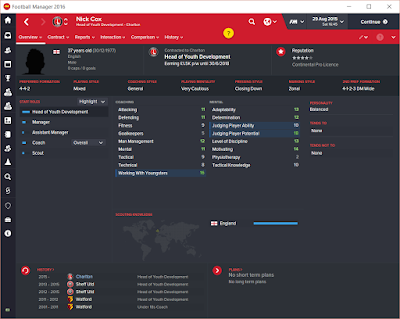 The club's reputation isn't exactly the best so I won't be able to bring in the premium coaches that I would necessarily want, so instead I am going to focus on up and coming younger staff that have the potential to develop with the club. This will minimise the wages but still let us bring in some decent staff who can make a difference. 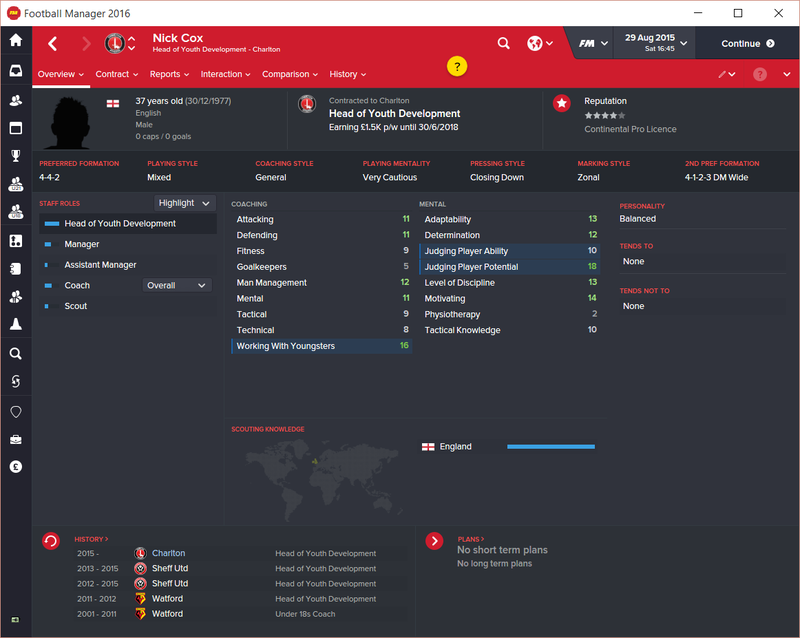 Taken from Sheffield United for a grand total of 40k, Nick is young enough that he can develop in this role but already has some level of skill in the role that I require. 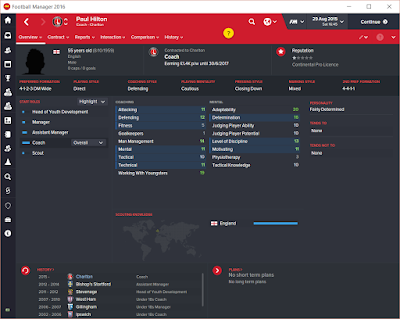 Very good at working with youngsters and judging their potential, the only knock on the "key attributes" highlighted by FM is his ability to judge players current potential, which is only average. This could have a knock on effect with his ability to judge potential but it is a risk I am willing to take. He is decent at motivating those under his leadership, while maintaining discipline, and he is fairly determined. 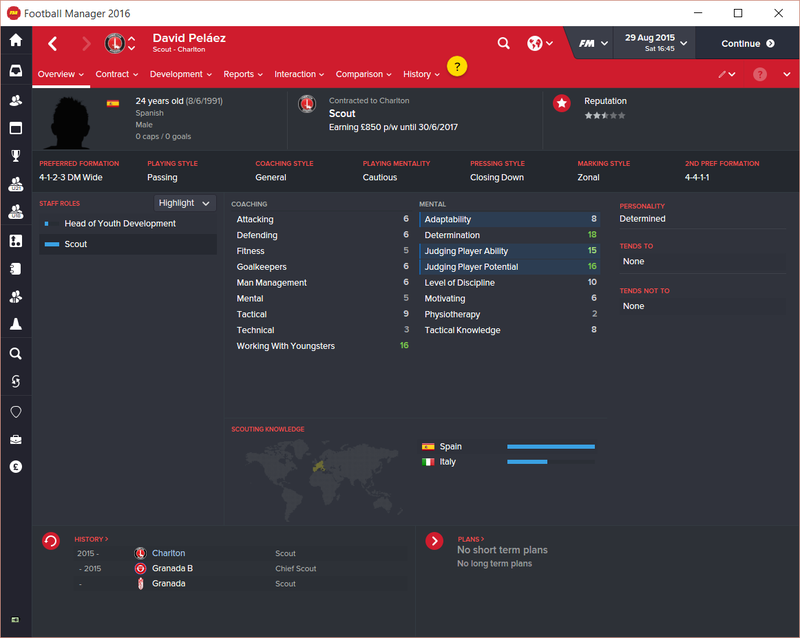 An added bonus is his adaptability, which will hopefully translate down to the young players coming through. I like to train players in a number of positions to build up the best skill set for each player, if they are more adaptable then this will be more successful. Looking at his history he has worked as a Head of Youth Development with Watford and Sheffield United (obviously) previously and generally their youth players are considered to be pretty good so I am hopeful that he will be able to help take Charlton onto the next level. While very young, he could still be playing at some level, Javi has all of the necessary foundations for me to build a long term management relationship with. Honestly, why was this guy available as a free agent? Determined, Highly motivated and very adaptable he will fit right in. The opposite of Neil, Javi is pretty good at determining players current ability but doesn't have the foresight to see where they will be down the line, but this doesn't bother me, I have scouts and other coaches for that. But his ability to judge players current ability may prove useful during matches and setting opposition instructions. Javi is also pretty good at man management and working with youngsters, as I want him to organise my coaches this will be very useful and as he will be coaching younger players it's good to know that this wont faze him. 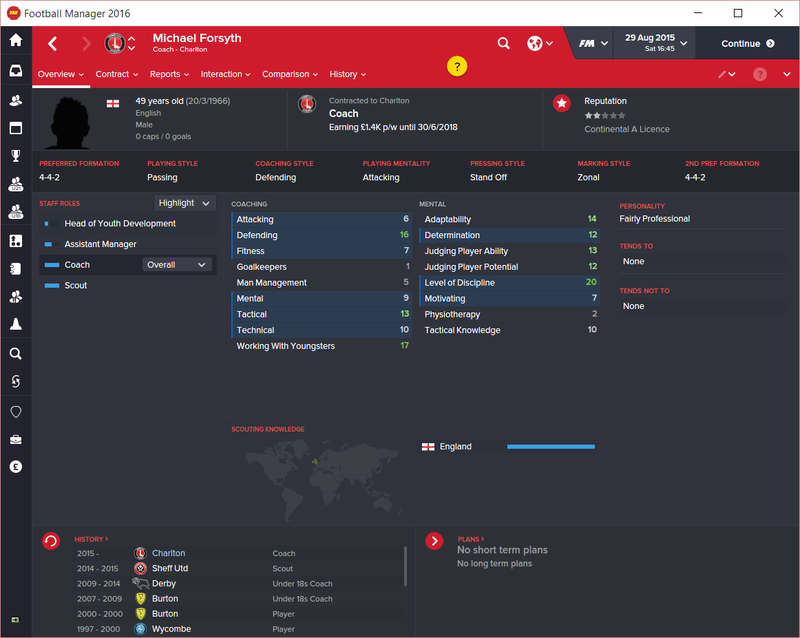 Starting alphabetically, Michael Forsyth has a number of years experience coaching and scouting. Working his way up through the ranks at Burton and Derby as an Under 18s coach, he moved into scouting with Sheffield United for a year and becoming a first team coach seems like a natural progression. While the motivation may be an issue hopefully the level of discipline will make up for it. He is also decent at judging player potential and ability so I may come to him when I need to judge just how good a player is and could be. His main focus will be on developing my defenders with that defending attribute, and at 49 I don't think he is too old to learn a few new tricks. Next up is Paul, he is the oldest member of staff I have brought onboard at 55 but with a good spread of attributes I couldn't leave him on the coaching shelf collecting dust. With a lot of experience at the Under-18 level I know he will be good at working with youngsters, and with Ipswich and West Ham on his CV he must have been doing something right. 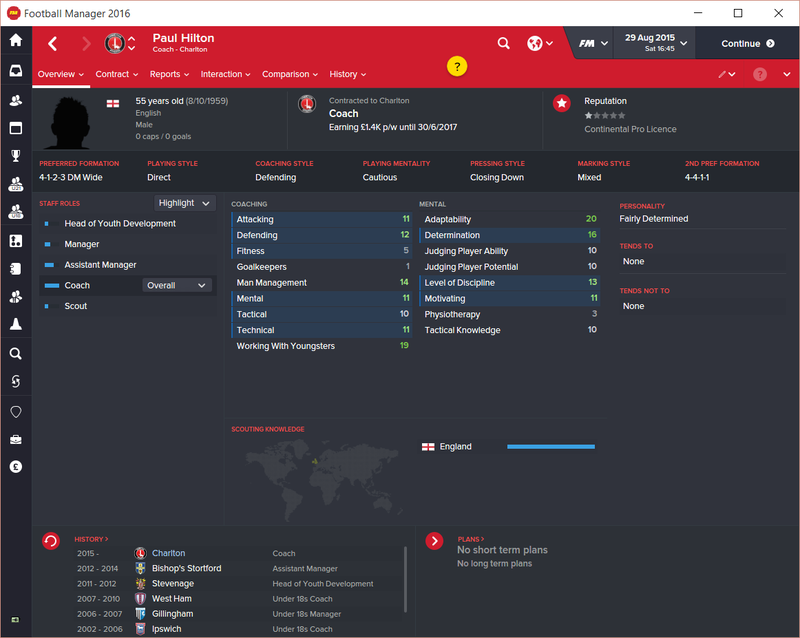 In more recent years he has worked at Stevenage and Bishop's Stortford, not footballing powerhouses but it gave him experience in some different backroom roles and who knows when that could prove useful! There isn't one area of his attributes that really stands out as a coach, but as I only have a limited number of staff I can bring in someone that is a jack of all trades is not necessarily a bad thing to have. Roger is a holdover from the last regime, not particularly special it is probably worth keeping him around for the moment as he will have valuable knowledge that could be lost otherwise. 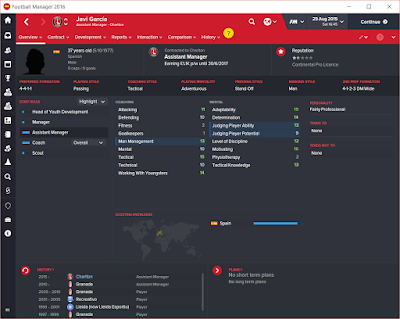 He's also the most experienced scout I have and hopefully able to organise the rest of his team reasonably well. I also feel that I can rely on him to identify who is a worthwhile transfer target and who isn't with his ability to judge players being better than average. 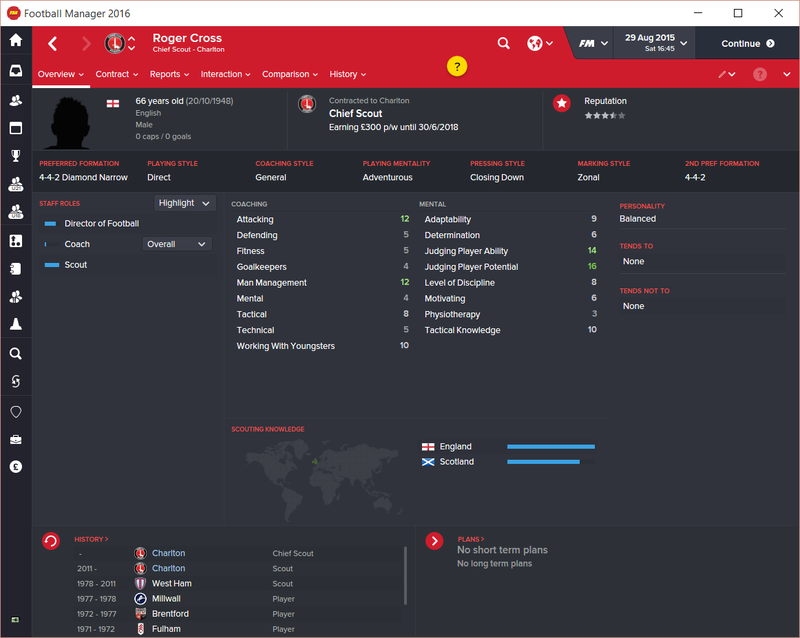 These are the key job specifications for a scout and he ticks the boxes so hopefully he lives up to the job. The rest of the team come from different areas of the world. Bruno has worked in Italy for a number of years before he was let go by Perugia. His knowledge of Italy has already lead to one scouting discovery for the first team and highlighted some younger players who I will continue to scout throughout the year and look to sign next summer. 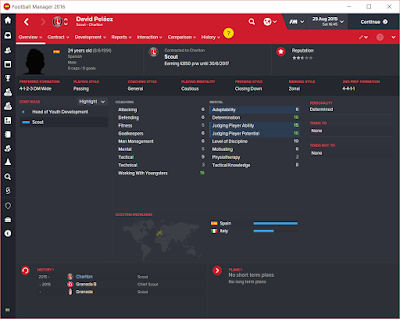 David may struggle to settle in at first as he isn't very adaptable, but he is very determined and very good at identifying new talent. 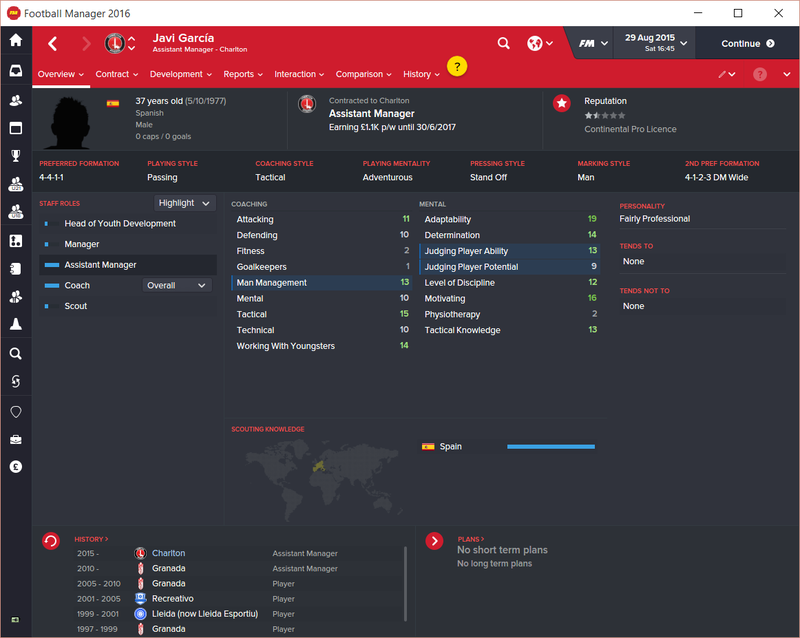 At 24 he is very young to be in the backroom staff but he was a scout for Granada and chief scout for their "B" team, so the talent is there. Bringing knowledge of Spanish football to the club is always appreciated and his additional knowledge of Italy will hopefully complete the knowledge that Bruno brings. 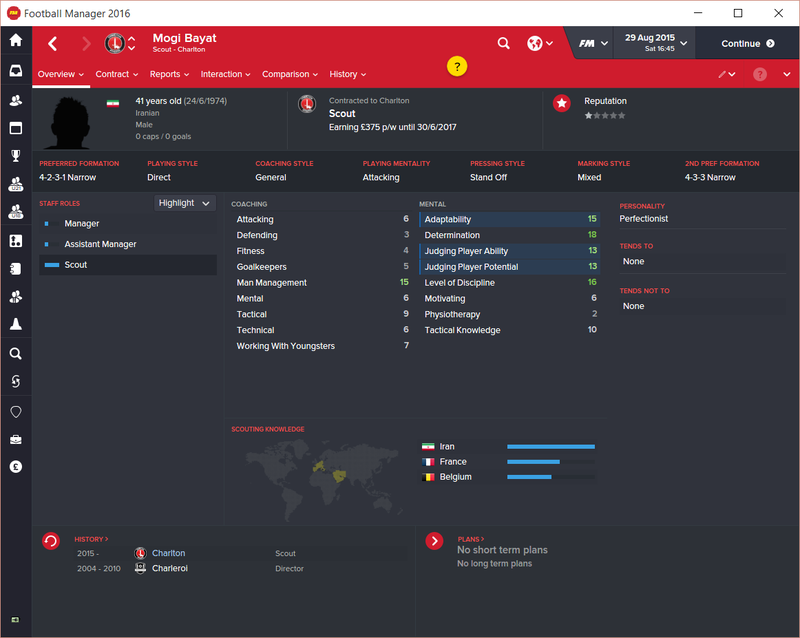 Last, but certainly not least is Mogi Bayat. Adaptable, Determined and decent at judging players, our Iranian connection has knowledge of more countries than the other members of our scouting team. France and Belgium are very good footballing nations so if Mogi can help us find even one or two diamonds in the rough it would be greatly appreciated. Also, if there are any players in Iran capable of playing at the required level then hopefully he will be able to bring them to our attention. So there you have it. Welcome to the team and hopefully there will be many years of success to come!